The Beast from the East and Storm Emma brought severe snow and freezing weather to the UK. A sudden rise in temperature then caused frozen pipes to burst - leaving thousands of homes across the country without water for a third day. If you're affected you are likely to be able to claim compensation. Newsbeat's been looking at what your rights are and how to get the cash. So if your washing up's piling up and you can't take a shower, read on. Maybe. You're entitled to compensation if you've not had water supply for half a day, according to water industry regulator Ofwat. 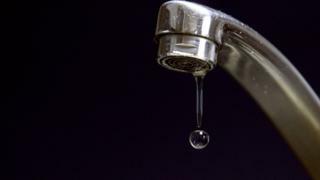 "After an initial period without water, usually 12 hours, water companies should automatically pay you £20," says Mike Keil, from advice group Consumer Council for Water. "Then an additional £10 for every 24 hours your home's taps are still running dry," he adds. "There is an extreme weather exemption but we do not think it applies to the recent disruption experienced across the country," Mike says. Ofwat has told Newsbeat it is expecting water companies to pay out for the outages we've seen over the last few days. Your compensation should automatically be paid to whoever pays the bills. So it's worth keeping an eye on your bank statement and even your online water company account or bill. But if you want to check, there's nothing to stop you calling your water supplier. You can find out who supplies your water online. These are the main companies affected, but some are warning their call centres are particularly busy at the moment. The Consumer Council for Water represents everyone who pays for water in the country and its website has extra info for people affected by the recent outages.